Download our Fall Organizers and Activities Content Pack, featuring such useful templates as calendars, morning meeting activities, attendance charts, seating charts, daily graphing activities, and more. You can choose completed lessons, or select from the many festive images and templates to easily create your own customized activities and lessons. With this Content Pack you can quickly get organized and in the holiday spirit, no matter how you like to create and customize your lessons and resources. 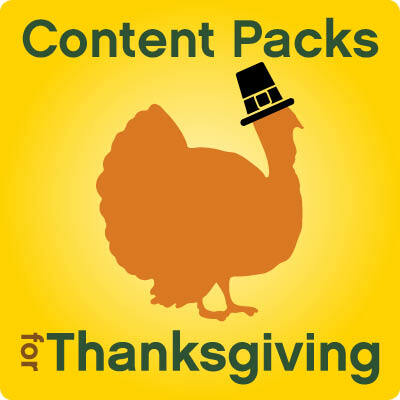 The Thanksgiving Gallery Pack contains fun holiday images, templates, multimedia, and lessons/activities. Use the templates, clip art, and multimedia to create your own Mimio lessons, or find our ready-made lessons and activities in the Lessons tab. We also have an excellent lesson, The Harvest Ceremony: The First Thanksgiving, to walk your students through the history behind the first Thanksgiving. It stars the Wampanoag and Narragansett Indians, along with the Pilgrims. This lesson meets every requirement on Mimio's Instructional Design Checklist, and it will help your students understand the facts behind the fun and tradition of the holiday. Mimio wishes you a wonderful holiday season with your students, friends, and family.